We discussed about MDS and MDS support for Service Bus in 12c in previous post. 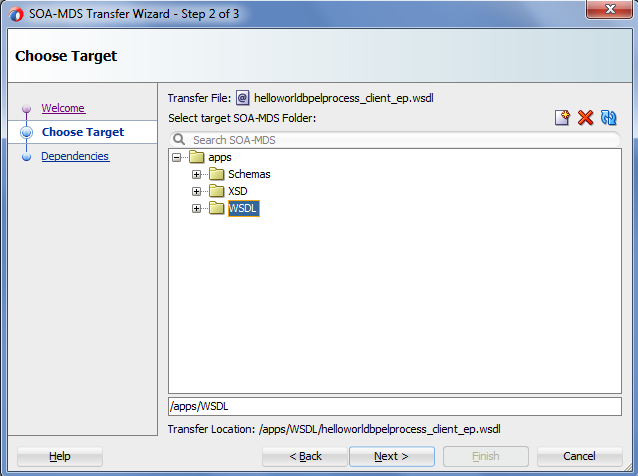 We also saw how to use WSDL file which is there in MDS to create service bus business service. If you didn't read my previous post, you can click here to read that post. We also mentioned about one additional feature which is provided in Jdeveloper 12c in that post. We will discuss about that feature in this post. In this post, we will see how we can use Jdeveloper 12c to publish artifacts from service bus project to SOA design time repository. SOA design time repository is file based repository which is based on Java DB. By using this feature, we need not to manually copy artifacts from project directory to MDS repository directory; we can perform this task from Jdeveloper itself. This makes development work really fast and less error prone. Above mentioned feature was not there in previous of Jdeveloper which is 11g. This is new feature which is introduced in Jdeveloper 12c only. This feature is also available for SOA projects. You can also publish SOA project artifacts to design time repository from Jdeveloper. Let’s start and see how this new feature works. We have created one sample service bus project, click here to see how to create sample service bus from Jdeveloper 12c. You can also create service bus project from service bus, if you want to see how to create project from service bus then click here. We have one WSDL file there in the project which we will publish to SOA design time repository from Jdeveloper 12c. To publish that WSDL file, right-click on that and choose Service Bus à “Publish To SOA Designtime Repository”. You can perform this for XSD file as well. 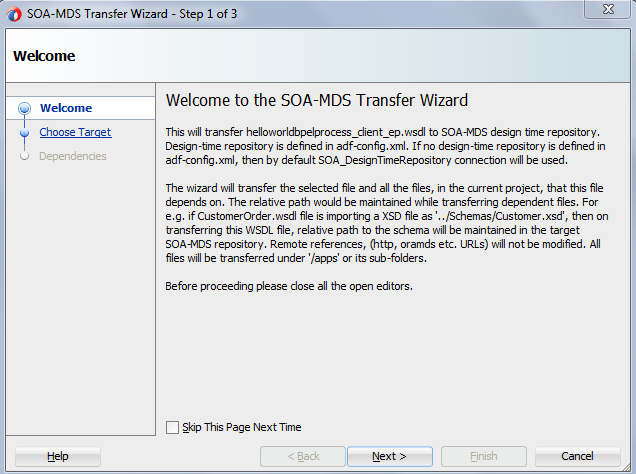 This open MDS transfer wizard which helps to publish the artifacts to design time repository. In first step just click on next, in second step you see apps folder and different folders under that, you can choose the folder to which you want to publish this file and if that folder is not there then you can also create a new folder and choose that folder, once done click on next. In third step, you see all the files which will get publish to MDS. If you noticed we only selected WSDL file to publish to design time repository but this also shows XSD file along with that WSDL file because WSDL file has reference to that XSD file so XSD file will also get published to design time repository along with WSDL file. There is option to overwrite the files which are already there in MDS with the new files, if you want to do that then check below check box. Click on finish to complete the publish process. Now if you want to verify it, you can open the SOA design time repository in your Jdeveloper and see whether that WSDL file get published or not, you will notice both WSDL and XSD files are there in design time repository.